English translation from: Kamakau, Samuel M. Ruling chiefs of Hawaii, rev. ed., 1992. 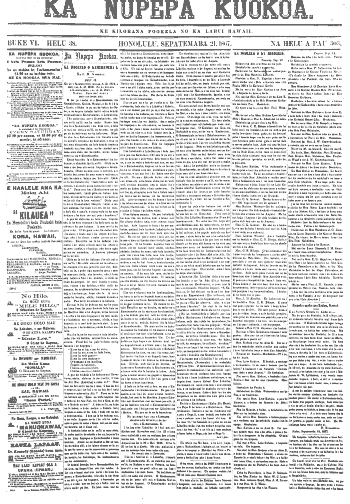 Original text from Ka Nūpepa Kū‘oko‘a, Sept. 21, 1867. With these words, Ka‘ahumanu, the favorite wife of Kamehameha I, created the office of Kuhina Nui. Endowed with the aura of her late husband, she dominated the governance of the kingdom for thirteen years. She ruled first with Kamehameha II until his departure for England in 1823 and then as regent for Kauikeaouli (Kamehameha III). Ka‘ahumanu assumed control of the business of government, including authority over land matters, the single most important issue for the Hawaiian nation for many generations to come. Intelligent and shrewd, Ka‘ahumanu instigated the breaking of the ancient kapu system following Kamehameha I’s death in 1819. She converted to Christianity, supported the Protestant missionaries, and proclaimed laws based on Christian principles. In 1826, she paid the national debt by imposing a tax payable in sandalwood, cash, or woven mats. Her administrative actions would have far reaching political, social, and cultural consequences for the Hawaiian nation. Ke‘eaumoku, a chief of Hawai‘i Island, warrior and loyal follower of Kamehameha I, gave his daughter into Kamehameha’s care when she was about 10 years old. She would be his favorite wife. Nāmāhana was a high ranking Maui chiefess. 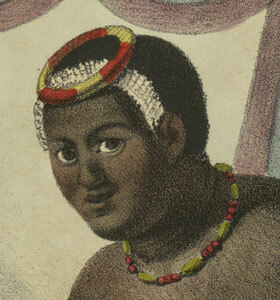 Kaumuali‘i (1821-1825). When Kaumuali‘i ceded Kaua‘i to Liholiho in 1821, he was taken back to O‘ahu where Ka‘ahumanu took him as her husband. Keali‘iahonui (ca. 1822-1825): a son of Kaumuali‘i whom Ka‘ahumanu also took as husband. When she became a Christian, Ka‘ahumanu gave up Keali‘iahonui to conform with her new religious beliefs.